Most gingerbread men share the same roughly humanoid shape, with stubby feet and no fingers. Many gingerbread men have a face, though whether the features are indentations within the face itself or other candies stuck on with icing or chocolate varies from recipe to recipe. Other decorations are common; hair, shirt cuffs, and shoes are sometimes applied, but by far the most popular decoration are shirt buttons, which are traditionally represented by gum drops, icing, or raisins. A gingerbread man is a biscuit or cookie made of gingerbread, usually in the shape of a stylized human, although making other shapes, especially seasonal themes (Christmas, Halloween, Easter, etc.) and characters, are quite common as well. I made this Cookies following www.mccormick.com website...I did not modify anything. Just followed the ingredients & instructions and made this cookies. Most gingerbread men share the same roughly humanoid shape, with stubby feet and no fingers. Mix flour, ginger, cinnamon, baking soda, nutmeg and salt in large bowl. Set aside. Beat butter and brown sugar in large bowl with electric mixer on medium speed until light and fluffy. Add molasses, egg and vanilla; mix well. Gradually beat in flour mixture on low speed until well mixed. Press dough into a thick flat disk. Wrap in plastic wrap. Refrigerate 4 hours or overnight. Roll out dough to 1/4-inch thickness on lightly floured work surface. 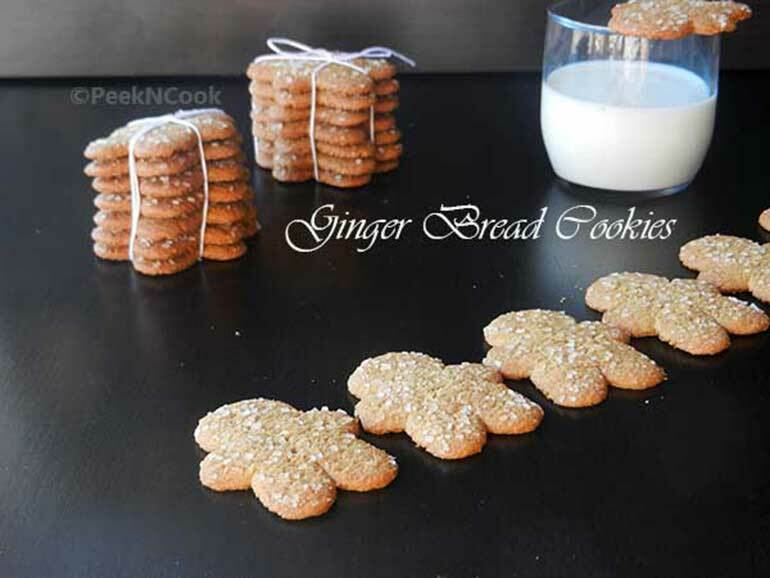 Cut into gingerbread men shapes with 5-inch cookie cutter. Place 1 inch apart on ungreased baking sheets. Bake 8 to 10 minutes or until edges of cookies are set and just begin to brown. Cool on baking sheets 1 to 2 minutes. Remove to wire racks; cool completely. Decorate cooled cookies as desired.